This is the first time that I had a Helicon on the bench. It’s a Helicon Digital jump hour with a Förster 201 movement under the hood. These funky jump hour watches are typical of the 1970s. The case is in a bad condition. The base metal is visible underneath the chrome as you can see. The only solution would be to get it re-chromed. The crystal was scratched and needed to be polished. The watch was running slow and it had an amplitude of <200 so it needed a service. The jump hour mechanism works with 3 discs. Hours, minutes and seconds. The minutes disc is fitted on the cannon pinion and the seconds disc is fitted on the pinion of the second wheel. Just like a “normal” watch. The hour disc, however, acts very much like a date wheel in a watch with calendar works. The cannon pinion (blue arrow) turns once per hour. Then its pawl will drive the wheel (red arrow) that forces the hour disc to advance. 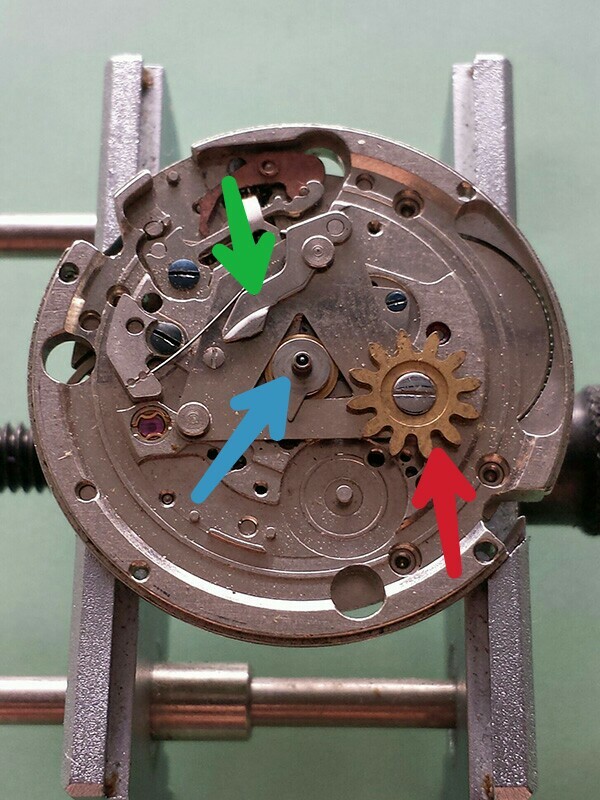 The jumper and its spring (green arrow) make sure the hour disc only advances 1 position at a time. Remove the power from the mainspring. This movement has the click underneath the barrel bridge. Wind the crown a bit and catch the click with your tweezers. Then move it away some more while letting the crown slip between your thumb and index finger. The balance and pallets removed. Then lift the barrel bridge and the wheel train bridge to expose the main barrel and the gear train. Lift the gear train and the main barrel. The main barrel in this particular movement has the ratchet wheel on top of the barrel and acts as the cover lid as well. The crown wheel is underneath the barrel bridge and connects to the small intermediate wheel. Turn the movement around and remove the jump hour parts. Then, remove the motion works and the keyless works. I like to pre-clean with a peg wood. That includes the bearing jewels on both sides, the anchor pallets, and the anchor crown. I also like to clean areas with a lot of grease and dirt with a peg wood or cocktail stick. Then I put everything in the watch cleaning machine for a thorough cleaning. Start with the main barrel and the gear train. Remember that the center wheel (actually the 4th wheel) sits under the 3rd wheel. Fit back the 2 intermediate wheels and the click. After that, install the wheel train bridge. Refit the barrel bridge and flip the movement around. Install the keyless works and lubricate the bearing jewels. Turn the movement back around and lubricate the bearing jewels on this side as well. Install the pallets and the balance (lubricate the exit stone of the pallets). Lubricate the Incabloc capstones on both sides of the movement. Reassemble the jump hour parts and fit back the discs. Start with the hour disc and install the minutes disc after the hour disc has just jumped to a new position. Place the minutes disc with the 00 position exactly opposite the crown. Recase the movement and test if everything works as it should. Do you have a jump hour in your collection? Would you like to add one? Tell me about it in the comments below! Why not completely remove the chroming and polish the metal underneath to a mirror finish? or even satin finish? It would look better than a scratched chromed case, imho. Yes, you may be right there. However, I don’t like to work on cases, except to straighten a lug or something. I’ve had a couple cases rechromed or replated but never polished. I wasn’t planning on keeping this one so the new owner can determine what he’d like to do with it.